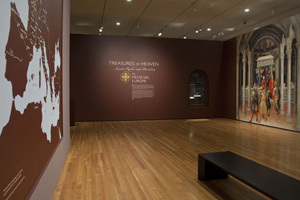 Treasures of Heaven: Saints, Relics, and Devotion in Medieval Europe was organized by the Cleveland Museum of Art, the Walters Art Museum, Baltimore, and the British Museum, London. This exhibition is supported by an indemnity from the Federal Council on the Arts and Humanities. Support for the exhibition has been provided by the National Endowment for the Humanities and the Samuel H. Kress Foundation. Treasures of Heaven is co-curated by Martina Bagnoli, Holger A. Klein, C. Griffith Mann, and James Robinson. View photos of the exhibition space at the Cleveland Museum of Art.